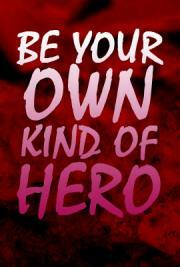 BE YOUR OWN KIND OF HERO is a subliminal reminder that we can all become the best of what we can be. The road may be wide and characterized by craters or holes. IT may be dusty, dirty, and winding but these are just spices to make the journey more puzzling and motivating for the passer on the road to either improve, endure, or enjoy.